Combine 2/3 cup onions, soup, milk, pepper, beans, and cheese in a large mixing bowl. Mix until green beans are fully coated in soup and milk mixture. Spoon mixture into a 2-quart casserole dish. Bake at 350 degrees for 25 minutes. Remove from oven, top with remaining onions, and bake for an additional 5 minutes. 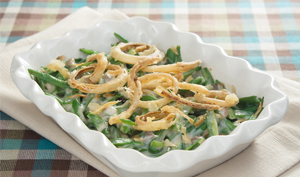 Remove from oven, allow to cool for 15 minutes, and enjoy your green bean casserole.